Standard zoom lens with an Image Stabilizer and high zoom ratio. With the Image Stabilizer turned on, you can obtain sharp, natural-looking pictures in dim lighting without using flash or a tripod. Very handy for places where flash is prohibited. Uses ring-type USM for swift, silent autofocus and full-time manual focus. Closest focusing distance is 20 in. (50 cm). It's not bad....but it's not great either, especially if you try and compare it to far more expensive lenses (which for some reason a lot of the reviewers here seem to be doing). But this is not an expensive lens. It looks, feels and performs like a reasonable walkabout lens. If you're a professional photographer then you won't want one. If you're solely taking landscape photo's then you won't want one. If you spend your time on portrait photos, you won't want one. If you only do macro shots, then guess what? You won't want one. But, if you're not a professional and need a general purpose zoom lens for around £300 (new, UK price) then this is a very attractive proposition. Let's not also forget - the lens is only as good as the rest of the hardware you are using. If you have a £2000 body, £1000 printer and £800 monitor then of course you're going to see more defects in the photos, using a £300 lens! I've got this lens on a Canon 500D body and am very happy with the combination. So, with all this in mind, it gets 4 stars value rating and 2 stars Overall. Yes, there a re infinitely better lenses available, but not for the same money. Good at sucking the money out of your wallet for a piece of crap. This lens is one of the worst lenses i have ever tried, in my entire 35 years of photography. End of story. Definitely NOT worth even the $100 i paid for it. I have used many lenses, I own 24 myself. This is by far the worst. Good range, decent sharpness, can be used on film cameras, too. Crap. I've had this lens now for 18mths and I'm always questioning the quality of the images. I've taken it on 4 overseas trips as a walkaround lens and I have never been happy with the images when I have returned. 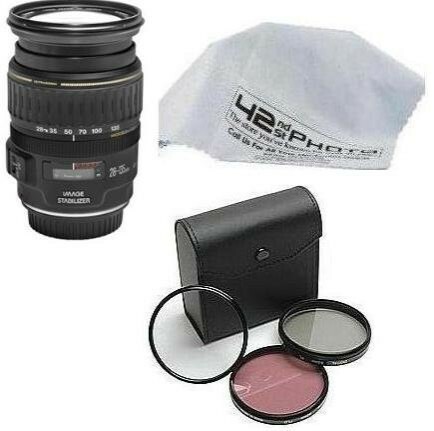 The fall out of quality towards the edges at any focal lenght is unaceptable for a lens of this price. I use this lens with a UV filter and a CR Pl filter and the brightness in the view finder on my 30D is so low. I have had it back to Canon twice for repairs over the time that I have had it, both times the AF would be incorrect at the full wide and full zoom. The IS would never settle upon focusing and the image would "jump" in the view finder. If I had known that this lens was as bad as it was I would have sunk the money into a 70-200 f/4 L and done away with the loss in focal lenght from between my 10 to 22mm canon (which is a far more superior quality lens for the money compared to the 28 to 135mm) and the "L" series. If I had paid AU$200 for this lens I wouldn't mind, but the premium price does not reflect the quality of the lens that you get. If you are interested I have comparitive Koren lens test files between the 28-135mm, 70-300mm and the 100mm for a true comparison. Canon warranty has been good. IS making indoor shooting quite convenient without using a flash. THis lens has a decent zoom range which is actually quite good for portrait. IS works quite well in low light conditions, but still I would get occasional blurred pictures. However, it works much bettern than one without IS. Picture quality is what I have expected. It 's not tack sharp but OK. However, autofocus is fast and precise. High degree of sharpness for intermediate lens., and hangs in pretty well against high level glass for most applications. Very useful zoom range for film and full size digital cameras. 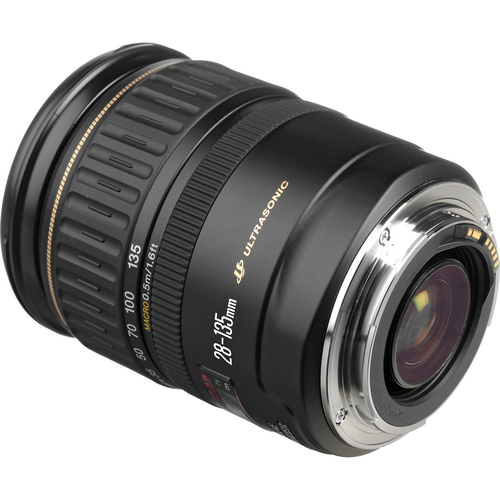 One of the best general purpose lens' around, and meets expectations for price. Slight distortion at zoom extremes. Typical slow aperture at max zoom (but you pay a lot more for faster glass). 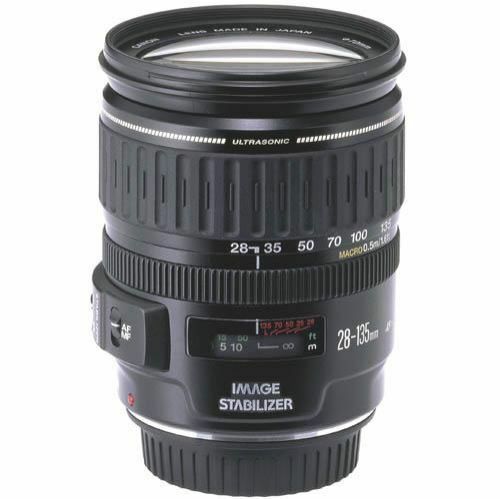 I bought this lens on ebay to compare to the Tamron 24-135 already in my possesion. I'd been happy with the Tamron, but wanted to see how the IS would work along with my high level EOS bodies (1N, 3, Elan 7e) as well as compare sharpness. The first favorable impression was the AF speed and accuracy. BIG difference on all bodies, especially the EOS3. Picture quality is as good or better than the Tamron and with the addition of IS and full time manual focus capability for touchup if the AF grabbed the wrong point it was no contest. The Tamron went to market along with the EOS 1n a little while ago. As has been said many times, it's not 'L', but it's more than acceptable for any but the most critical applications. Would a little more speed be desirable? Sure! But, at what cost? I don't seem to have a problem with zoom creep as some do, and I find the polycarbonate construction excellent for what it is. You can't compare the feel of a modern lens to the all metal construction of the past. Mine is smooth in the zoom action, having much less drag thean the Tamron, and as I said, the AF is great. It's become my full time carry around, and I don't regret buying it. My only experience with Canon service was a defective flash system on my Rebel G under warranty. Fast service, and correct fix. I bought this lens as I was doing somephotos for a friend from a helicopter. The IS feature certainly helped and the images were excellent although on some, a little over exposed. Once I'd compensated for this on my Rebel XT, the images were great. I have this as my all purpose lens now and it seems to do everything I need it to - especially shooting with less light. It's great if you're doing indoor shots and want a more natural light feel. My only complaint is that I had to compensate for over exposure and the filters are expensive due to the 72mm size. 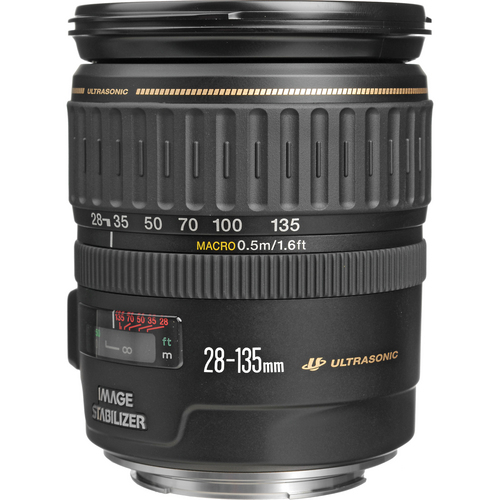 This is one of those lenses that get me much PO'd when I read some of the reviews. People, do and will continue, to compare consumer lenses and their quality against the big money 'L' glass. They're not the same! leave it at that. This lens is one in particular that suffers because of it. Until recently the 28-135 IS USM was the only serious lens that canon made in this zoom range. Yes there are two 28-105 models available, the EF 28-105mm f/3.5-4.5 II USM not being a terribly bad lens but the EF 28-105mm f/4.0-5.6 USM was put in as a kit lens, I believe, because it looked better than a body cap. Which brings us back to our poor old 28-135. It has been said that this lens is extremely soft. It is soft, there is no arguing that, but extremely soft? That could be argued. If you're using a digital camera there is an easy fix, escially if you are shooting in jpeg. Jack up the camera's sharpness function. It won't be as good as some Canon's better lens but you could easily get an acceptable 8X10 out of the picture. If you're shooting film don't worry too much as most films couldn't resolve that kind of sharpness anyway (at 35mm) As far as image quality goes (apart from resolution) contrast, though not really punchy is perfectly acceptable and there is very little distortion that could see. Vignetting is almost nil, which is more than I can say for some of Canon's "pro" glass.The Bokeh I find very apealing, though this can always be argued. I originally bought this lens for my wife so that she would give me back my 24-70. We were asked by my son's school to shoot their sports day and I thought this may be a good chance to run this lens through it's paces. One of the oddities I noticed was shooting with the IS. All of the images shot outside with IS on came out very soft but as soon as I turned the IS off everything was as it should be. I'll be the first to admit that I am no expert when it comes to IS but it seems as though it doesn't handle rapidly changeing situations well. The opposite is true while inside. Shooting a Birthaday party I was able to shoot perrfectly sharp images with no effort at all, and when stopped down to f8 the quality was as good as any 'L' lens. It is a reasonably compact light lens compared to it's contemporaries, and in practice an excellent mid range lens. Now that Canon has an 'L" series lens in this zoom range hopefully the slamming of this lens will stop but intead I'm sure there will be those who will compare it to the 24-105 anyway. Just remember you can buy that sharpness for another $600. My only really major beef with this lens and it's not really against the lens but is that of every Canon consumer grade lens. Canon are you listening? People buy these lenses because they can't afford the pretty red ring so why do you go and charge them another $40-60 for a lens hood. Canon and Nikon appear to be the only two who follow this practice. To the dust propnents, I say, I bought the lens used and it had no dust in it, I've used outside, inside, in the rain and I still have no contaminents inside. I'm sure over the years it will eventually get some dust inside but it certainly no "dust pump". If you want a dust pump look no farther than Canon's push-pull zooms (35-350L, 28-300L and 100-400L) Funny... they're all pro lenses. Pleasent enough but o-so slow. IS to a certain point.. Its solid wieght makes it hand holding easier than a lightly built lens at same range. Built qualtiy is very good for its class. Good results at sweet its sweet spot aperture (around f8) with nice colours. Due to extending (pump style) design it is a dust collector- and requires more care when handling. Expensive fragile hood (sold separetely). Use of polarizer filter is cumbersome with/without hood. Just like other lenses of this class expensive to buy(In Sydney/Austr.). And most importantly, soft,soft low contrast with washed colours at wide open. You don't need soft focus portrait lens with this one! Just use it wide open.(!) Seriously speaking, this is not a high grade lens at max apertures. Beatifully built for indoors.. It is not a light weight but solid built - well balanced when attached to a 20D. Fast focusing, quiet and IS is useful when hand-holding within 2 -3 stops range. Buut IS mode is no match to a solid tripod. For best result sweet spot and tripod combination is essential. Doe to its extending piston design it is dust collector for inner elements and to your DSLR sensor. Overall; I think it is a good intermediate level zoom lens with bells and whistles..
70-200 mm F4L lens, 28-105mm Nikkor lens, 18-70mm Nikkor lens.